Bertolli had a big year coming up but needed a digital makeover. In order to give a more premium experience within the template restrictions, as well as align more closely with the global sites, we designed a complete reskin for the responsive US site. 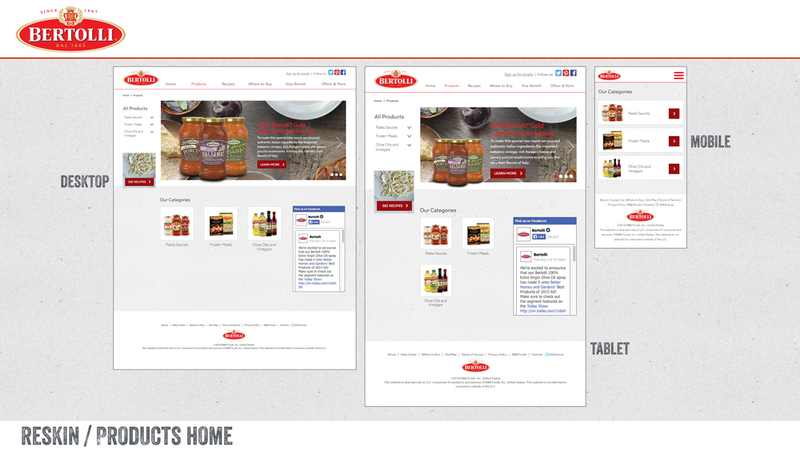 Next, we created a landing page hub to celebrate the 150 year anniversary for Bertolli which housed 150 tips that we created and rolled out throughout 2015 with simple ways to bring Tuscany to your table. These tips range from still images, videos and cinemagraphs. As Creative Director, I was the lead for teams in both our New York and Seattle offices throughout the concepting, design and development/production for the projects.